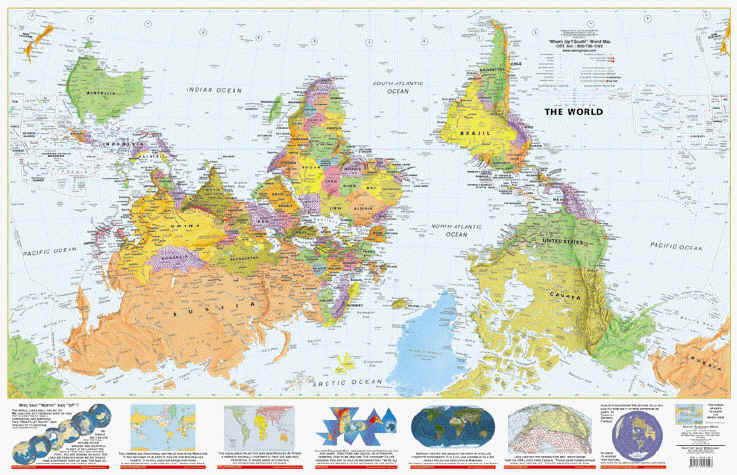 The world map that we are used to seeing doesn't accurately portray the relative sizes of land masses. This is because we're taking a curved 2D surface, and projecting on to a flat 2D surface. The map linked to below uses a different method of projection. In this map, the relative sizes of countries is accurate. I think the size of Africa is pretty astounding, and how small Europe is. Also, I never realized that Brazil was almost as large as the USA. Interestingly, there are dozens of different ways we could draw our maps. The one we use is no better than the others, it's just used for convention, but it's come to be the way we all think the world really is. The best way, and the only unambiguous way, is to use a globe. Last edited by kazza; 04-26-2010 at 02:27 AM. That is very interesting. Thank you for posting that. It just goes to show that we can still learn something new every day. I was also astounded to see how small Europe really is. The Wiki maps are actually beautiful pieces of art and I'm tempted to find posters and have them matted and framed. I kind of like this one as well. Puts Australia where we belong :rasta:. Haha, I thought I was dyslexic for a minute! Am I down side up here or is he up side down.